Cress Williams is The CW’s Black Lightning! The latest DC Comics series has found its star. Per The Hollywood Reporter, Cress Williams is set to play Jackson Pierce and his electrifying alter ego on the upcoming The CW series from Greg Berlanti (producer on the network’s Arrow, Flash, Supergirl and Legends of Tomorrow) and The Game and Being Mary Jane‘s Mara Brock and Salim Akil. Black Lightning, created by Tony Isabella and Trevor Von Eeden, made his first appearance in 1977’s “Black Lightning” #1. The story follows Jefferson Pierce, a former Olympian, who was secretly born with the ability to create and manipulate electromagnetic fields. Although he had abandoned his hometown in Metropolis’ Suicide Slum after the murder of his father, Pierce returns there with his wife and daughter, taking a job as a high school principal. It is after losing one of his students to the gang violence that threatens the city that Pierce decides to take advantage of his powers. Adopting the identity Black Lightning, he becomes a costumed superhero who goes on to serve as team member of both the Outsiders and the Justice League. Black Lightning has never before appeared in any live-action DC Comics adaptations. He has appeared in a number of animated projects, however, voiced by the likes of Levar Burton and Blair Underwood. He also made a memorable appearance in a 1992 Saturday Night Live sketch, played by Sinbad. Airing just after the iconic “Death of Superman” hit the stands, the sketch sees Black Lightning attempting to crash Superman’s funeral. You can watch the full sketch on NBC‘s official SNL site. Cress Williams is no stranger to the small screen having starred on series like E.R., Grey’s Anatomy, Code Black and Hart of Dixie. He can be seen coming up on the big screen in High Top Releasing’s Lowriders. 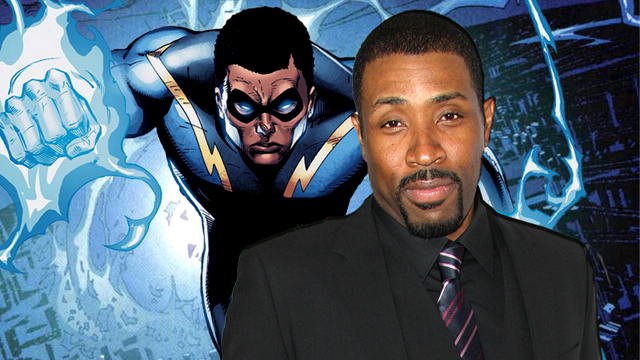 What do you think of Cress Williams as Black Lightning? Let us know your thoughts in the comments below!